Osanna Andreassi was the daughter of the wealthy patrician Andreasio. She experienced visions from her early childhood, but kept the experiences to herself. At the age of six, she saw the Child Jesus carrying a cross and wearing a crown of thorns. He told her that He has a special love of children and purity. She was so impressed, as we all would be, that she immediately consecrated her entire life to God. Osanna begged her father to allow her to learn to read so that she might be able to pray the Divine Office. He refused her request because it was a waste for a woman who was expected simply to raise a family. Osanna couldn’t explain why she wanted to learn; she couldn’t reveal her plans to him. When she was 14 and knew that he was arranging a marriage for her, she furtively went to the Dominican church and received the habit of its tertiaries. When she appeared at home in her religious garb, she explained that she had made a vow and must wear it until she had fulfilled her promise. Now, this should not be understood as condoning deceit, but it served God’s purpose. Her pious father accepted her explanation for a time. As the months passed he began to suspect what had happened. He had already refused to give her permission to enter the convent, and he was displeased that she should try to live as a tertiary in his own home. Eventually, his father’s heart melted and he allowed Osanna to continue her routine of prayer, penance, and charity for the rest of her life. She was not professed until a few months before her death forty-two years later. After the early death of both her parents, Osanna spent her fortune in the service of the poor. Her house became a center for people to discuss spiritual matters, for the needy and the sick, for the wealthy and the noble. It is said that like Saint Catherine, she miraculously learned to read. One day she saw a piece of paper with two words and said, “Those words are ‘Jesus’ and ‘Mary. '” From that time she could read anything pertaining to spiritual matters. By the same sort of favor, she also learned to write. At age 28 (1477), Osanna received the mark of the wound in Jesus’ side, caused by a long nail. For the next year various of the sacred wounds would appear, including the crown of thorns. Others saw them only on Wednesdays, Fridays, and during Holy Week, but it appears that they were visible to her and caused both pain and joy. At this time Osanna felt the need for a spiritual director and prayed for one with wisdom, patience, and understanding. She found him during Mass when an interior voice said to her, “That’s the one you need, the one who is saying Mass.” Osanna thought he was too young, but, upon meeting him in the confessional a few days later, all doubts were erased. 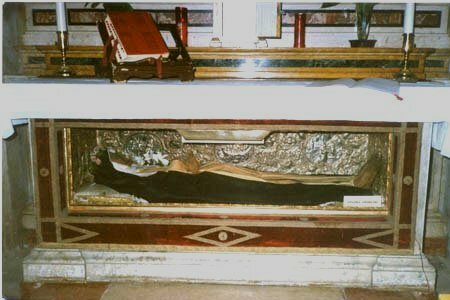 Before her death, the soul of Blessed Columba of Rieti, another Dominican tertiary, appeared to her and told Osanna to prepare for death. Representation: In art, Osanna is a Dominican tertiary wearing a crown of thorns, surrounded by rays of light (not the halo of a saint), a lily, a broken heart with a crucifix springing from it, the devil under her feet, two angels (one with a lily, one with a cross). This is similar to the image of Saint Catherine of Siena, who has a halo. Osanna is the patroness of school girls.